Beautiful lawns are planned and created. A good lawn fertilization program is an essential part of every great looking lawn. This page will give you the basic information you need to develop a fertility program. Almost all lawn fertilization programs are based on the Nitrogen (N) element. This is because nitrogen is the nutrient consumed by grasses in the greatest amounts. Furthermore, each grass type has a maximum amount of N that can safely be applied per growing season. Therefore, the secret to developing a good fertilizer program can be divided into two parts. (1) The first part is in knowing how much N your grass needs per year and then dividing that amount over the growing season. (2) The second part is in knowing the correct amounts to apply during the season. For cool season grasses, it is not equally divided. Too much N at the wrong time of year can harm the grass and also encourage diseases and insect problems. Too little N, regardless of grass type, can hinder photosynthesis and rob the plant of needed carbohydrates. Cool season grasses break dormancy in early spring and begin rapid growth. 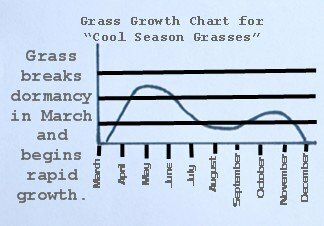 Grass growth slows in late spring and levels out in summer. Growth begins again in fall, but at a much slower rate. In the fall, most of the grass’ energy is focused on root growth and carbohydrate storage. Even after the grass stops growing in late fall, the grass is still very active until soil temperatures reach into the thirties. A lawn fertilization program takes into consideration what the grass is doing. In early spring, grass is programmed to use carbohydrates produced in the previous fall to break dormancy and begin growth. The lawn fertilization goal in spring is to apply just enough nitrogen to keep grass functioning properly and from becoming chlorotic. In the summer, especially in the warmer climates, cool season grasses struggle and easily become stressed. Too much nitrogen forces the grass to grow when it cannot support it. The goal is to provide enough nitrogen to prevent yellowing (chlorosis). Organic fertilizers excel in summer. They provide the needed N without burning, as well as, providing organic matter to promote a healthy population of soil microorganisms. The fall lawn fertilization strategy is important. This is when the largest amount of N is applied. Grass is switching from leaf growth production to root growth and carbohydrate storage. This will continue until the soil temperatures reach into the 30’s. The same amount of photosynthesis is going on, but instead of blade growth, it is focusing more on root growth and energy storage. The grass is able to handle higher levels of N than it could earlier in the year. In fact, the highest amount of N is applied after the last mowing of the year. Below are some popular grass types and their annual nitrogen needs. 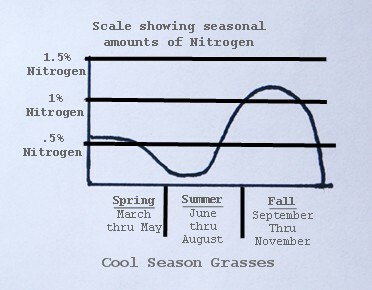 The list below contain the annual nitrogen requirements of a few popular cool season grass types. These are only guidelines and are based on professional fertility programs for high maintenance turf. All grasses have a high and low nitrogen requirement. Your lawn may do just fine on a lower fertility program. March-April............... .5 to .75 lbs Nitrogen. Obviously, the fine fescues can not take this much Nitrogen. A lawn fertilization program for fine fescue would be a spring and fall fertilizer application and organic fertilizer in summer. The first application of the year should include a pre-emergent for crabgrass, especially if it has been a problem before. Your grass needs specific levels of nitrogen regardless whether you are using an organic or inorganic fertilizer. If you are interested in an organic program, click here first for a better understanding of Organic Lawn Fertilizer. Lawn fertilization programs for warm season grasses are much easier to figure out than cool season grasses. 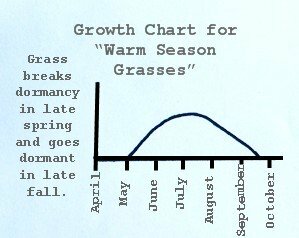 Warm season grasses break dormancy in late spring, reach their peak in mid-summer and begin to go dormant in early fall. Warm season grasses emerge from dormancy in spring and begin to go dormant in fall as soil temperature approach 50 degrees. These grasses turn straw colored when dormant and no photosynthesis or growth occurs until green-up in spring. Adding fertilizer when the grass is dormant is unnecessary and will have no effect on the grass. Warm season grasses have varying nitrogen requirements, so the amounts and timing of the nitrogen applications must be considered. However, a rule of thumb for many warm season grasses is to equally divide the total amount of nitrogen over the growing season. For bermudagrass, it is one lb of nitrogen for every month the grass is growing. It would call for lower amounts for zoysiagrass, centipedegrass and buffalograss. For low fertility grasses, equal amounts of nitrogen in two or three applications spread over the growing season will work. In the deep south or in places around the world where warm season grasses remain green all year, the grass should be fertilized as needed. If temperatures in winter are just warm enough to keep the grass from going dormant, don't use a heavy rate of fertilizer. Instead, use only enough to keep it from becoming chlorotic. (Turning yellow from lack of chlorophyll.) Too much fertilizer in winter will push the grass to grow when it shouldn't be growing that much. This forces the grass to use its stored carbohydrates. Below are some annual nitrogen requirements for common warm season grasses. All amounts are "lbs of Nitrogen per 1000/sq.ft. Some grasses such as centipede grass and buffalograss need to be fertilized only once or twice a year. Preferably in late spring and mid to late summer, depending on the temperature. Over-fertilization only harms the grass and encourages weed growth. Exact Nitrogen rates will vary depending on soil analysis, soil type and climate zone. Developing deep and far reaching grass roots is a major factor for increased nutrient uptake and less fertilization. Find specific and proven techniques for improved root growth. Nitrogen is the most important element in turfgrass fertility. However, different types of fertilizers can deliver nitrogen differently. See what sources of nitrogen are available from organic to inorganic, as well as, when and how they are best used. Manure is probably the earliest and least expensive form of fertilizer on the planet. It is still used today from large farms to family vegetable plots. Click here to learn the safety guidelines when using manure on your lawn or garden. Seaweed Extract (kelp), plant hormones, fish emulsion and other organic products are increasing being used in lawns and gardens. Find out what they are all about along with a few case studies that tested them. Using Agri-Gro's Turf Formula allows you to cut down on fertilizer input by up to 50% while improving your lawn's health and vigor. Click Here for More Information.